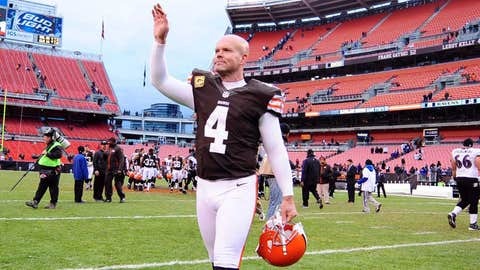 Before signing with the 49ers, Phil Dawson spent 14 seasons as the kicker for the Cleveland Browns. GREEN BAY, Wis. (AP) — Phil Dawson kicked a 33-yard field goal as time expired, and Colin Kaepernick threw for 227 yards and ran for another 98 to lead the San Francisco 49ers past the Green Bay Packers 23-20 on Sunday night in a frigid NFC wild-card game. In a back-and-forth fourth quarter, the 49ers (13-4) threw the final punch. Kaepernick escaped a blitz on third-and-8 and scrambled for an 11-yard gain to the 27 with 1:13 left. Dawson nailed the winning kick five plays later. San Francisco plays at Carolina next Sunday. Eddie Lacy ran for 81 yards on 21 carries for the Packers, while Frank Gore had 66 yards and a touchdown on 20 carries for San Francisco. But it was Kaepernick who was the difference-maker once again in San Francisco’s fourth straight win over Green Bay.